Total rip-off. If this hotel was priced accordingly, it would have gotten a much better rating from me. The value is a joke. We paid $230 USD per room. The location was very lovely but the rooms themselves were incredibly outdated and underwhelming. There were little bugs in the bathroom and when I turned the shower on, more gathered in the water on the floor. The only reason we stayed here was to be close to the Bimmah Sinkhole and the Wadi Shab, but I would highly recommend not wasting your money and visit the sinkhole on your way to our from Muscat to Sur, and stay in Sur instead, where the hotels are at least clean and priced fairly. The location is absolutely stunning and the bed was comfortable. Also room was clean and spacious. So I would suggest only one night here for the view/location alone! 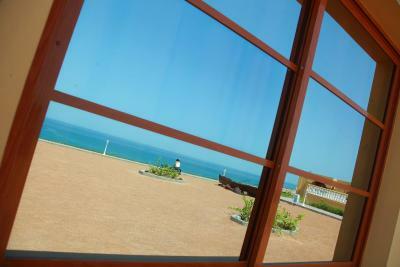 The location, view and weather were very nice, the staff wasn't bad and they gave us an upgrade for free. 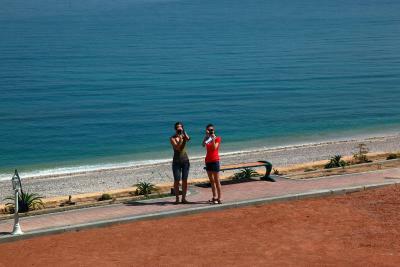 The location is very good... nearby bimmah silk role, wadi shab.. 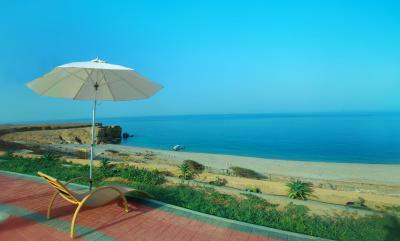 Location is nice near the beach and close to Wadi Shab however the hotel layout squandered the potential ocean views. Hotel entrance was poorly marked and gravel entrance was full of potholes. 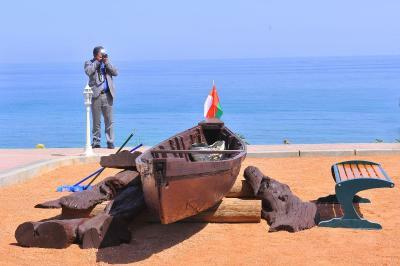 Good situation because is the only hotel between Muscat and Sud. When you do offroad in the Jabel Bani Jabil area is an easy place. BUT just for this, you paid 40 rials more than a hotel to Sud and the service is not at all good. 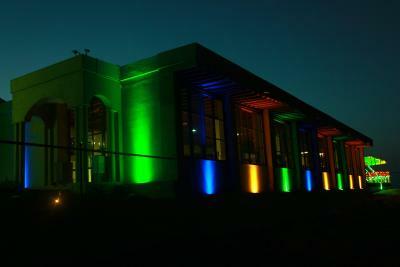 The terrace is the best in this place. A beautiful view and the location nearby two great wadis. 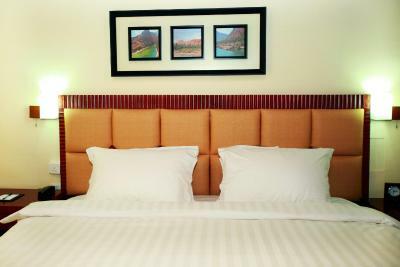 Sama Wadi Shab Resort This rating is a reflection of how the property compares to the industry standard when it comes to price, facilities and services available. It's based on a self-evaluation by the property. Use this rating to help choose your stay! Perched on the hill overlooking the Sea of Oman with back drop of Hajar Mountains, Wadi Shab Resort is located in Wadi Tawi. 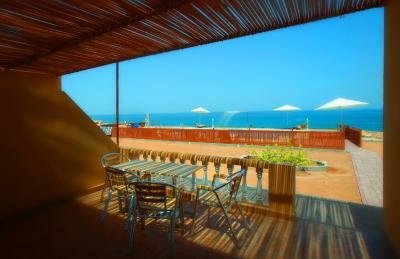 It features a private beach area, an outdoor pool and free Wi-Fi in all areas. 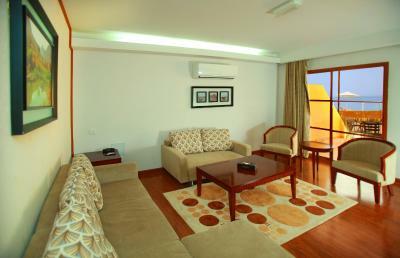 All rooms and suites are fitted with parquet floors and wooden furnishings. Each is equipped with a flat-screen TV, a wardrobe, an electric kettle and a fridge. The suite includes a living room with sofa. 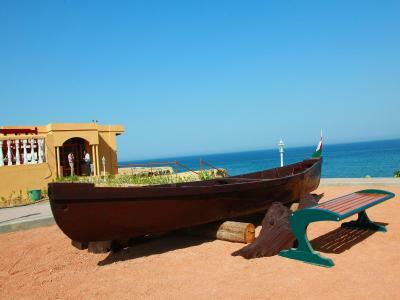 The hotel’s main restaurant overlooks the sea and serves Omani breakfast and dinner. International specialties are also offered at the restaurant. Room service is available 24 hours. 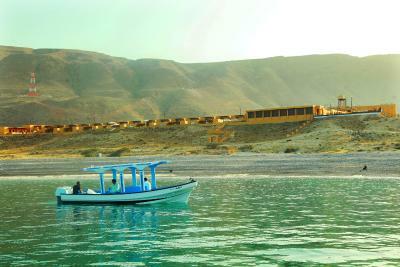 Wadi Shab with its aquamarine pools, waterfalls and terraced plantations, is located about 1.9 mi from Wadi Shab Resort. The tomb of Bibi Mariam is 2.5 mi away. Free private parking is possible on site. 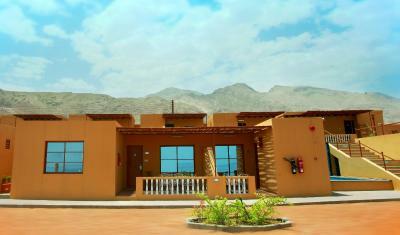 This property also has one of the top-rated locations in Ţīwī! Guests are happier about it compared to other properties in the area. This property is also rated for the best value in Ţīwī! Guests are getting more for their money when compared to other properties in this city. 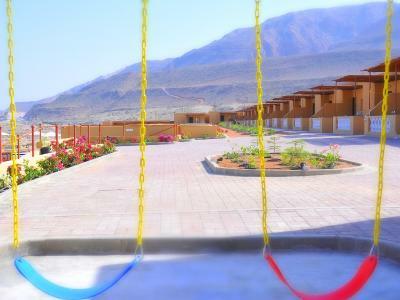 When would you like to stay at Sama Wadi Shab Resort? 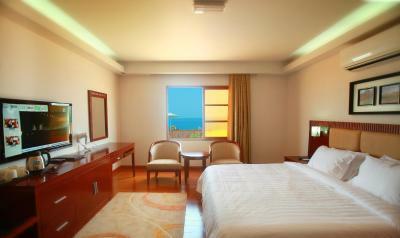 Featuring a sea view and a terrace, this air-conditioned room offers a small seating area with a flat-screen TV. Facilities include a wardrobe, an electric kettle and a fridge. The bathroom is fitted with a shower, free toiletries and hairdyer. 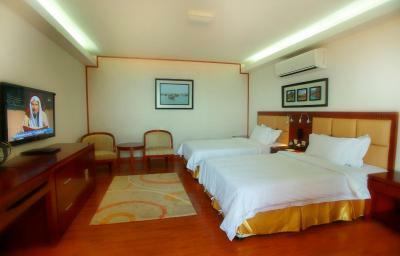 Featuring a sea view and a terrace, this large, air-conditioned room offers a small seating area with a flat-screen TV. Facilities include a wardrobe, an electric kettle and a fridge. The bathroom is fitted with a shower, free toiletries and hairdyer. 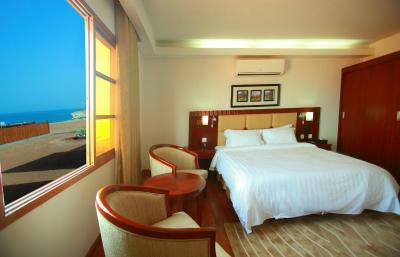 Featuring a sea view, this spacious, air-conditioned suite offers a living room with a flat-screen TV. Facilities include a wardrobe, an electric kettle and a fridge. The bathroom is fitted with a shower, free toiletries and hairdyer. Featuring a sea view, this air-conditioned has a seating area with a flat-screen TV, wardrobe, an electric kettle and a fridge. 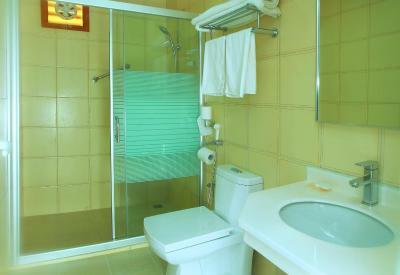 The bathroom is fitted with a shower, free toiletries and hairdryer. 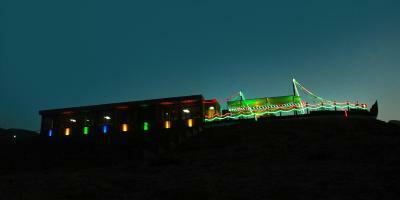 House Rules Sama Wadi Shab Resort takes special requests – add in the next step! All children under 12 years are charged OMR 10 per night for extra beds. 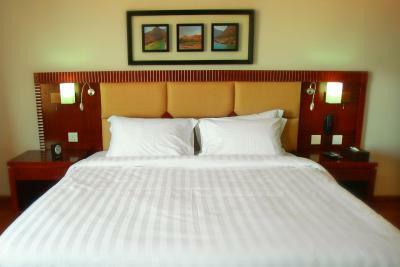 Any additional older children or adults are charged OMR 20 per night for extra beds. Sama Wadi Shab Resort accepts these cards and reserves the right to temporarily hold an amount prior to arrival. The room was full of dirt and built with super cheap materials. They only give you one towel per person. There is no internet in the rooms. Dinner and breakfast were very poor and really expensive for what they feed. The receptionist informed us that the payment by card was not possible because the system did not work, so we paid in cash and asked the receptionist that when the system return he would return the money and we would pay by card. The next day when we wanted to make the change, he told us that he had already sent the money to the bank!!!! and he didn't bring us an invoice. If you are reading my comment, follow my advice, better do the route to Sur or Muscat than sleep there. Breakfast could be better for the price and no wifi in the rooms. Food is not good and no variety. It’s either a bit expensive for what you get. In the bathroom there was a smell of sewage, there were no towels on arrival, the set I got afterwards was humid. The room was spacious but not well finished, no wifi, no good bed. Closed with a cheap aluminium door, more suitable for a garden shed. Restaurant in the evening was empty, when I opened the door there was only an odour of Indian curry and after seeing the rest of the hotel I dared not eat there anymore. There is nothing else in the neighborhood so I had no dinner. The hotel was far too expensive and therefore probably almost empty. For this money they should offer something more or drastically lower the prices. Do not go there! 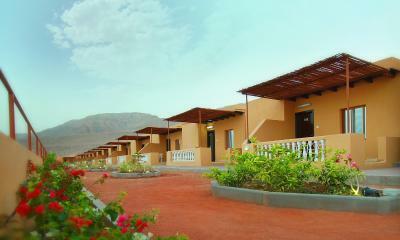 Nice resort in front of the Ocean, you can reach wadi shab easily by car. The pictures actually look nicer than this place really is. The room was basic, very dark, stuffy & grubby. The lock on our door kept breaking and we did lock ourselves out of the room a couple of times, which was annoying. We couldn't get any wifi in the room or communal areas. The hotel and restaurant are overpriced. The buffet dinner didn't offer much choice and there was not enough food brought out. We ended up taking a car to Tiwi to eat out. Breakfast was the same - just not enough food for the amount of people at breakfast. They run out of cups, utensils etc. fast and replaced them with plastic cups and spoons. Very badly managed. Unfortunately, there is no other hotel options nearby so they can get away charging 4-star prices for a mediocre 2-star accommodation. It was by far the most expensive stay of our 2.5-week trip in Oman (and we stayed in some very nice hotels) but unfortunately the least comfortable one. 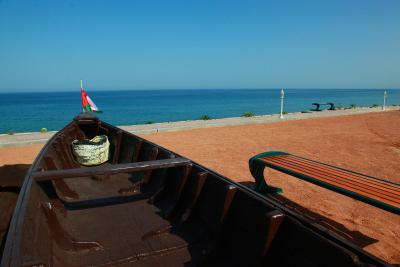 It's a very convenient location to explore Wadi Tiwi and Wadi Shab. The staff were so kind and careful to our comfort. They heat up some delicious Omani food for us as we arrived late and the restaurant was already closed, with no other restaurant around. They are charging way too much for a dated, dirty hotel. The dinner buffet was not very good either, but I'm not sure what other options are in the area. The price- far far too high for the standard of service offered and the fact it is a two star hotel. I paid the same as I did for the Waldorf Astoria on the Palm in Dubai, so this should tell you that the price is crazy and far too high! I would atleast expect an all inclusive resort for this price! The service- the servers and the reception cannot speak English we only came across one guy that could understand us and that was the gentleman that checked us in. People were friendly enough and polite but a bit frustrating trying to communicate. Food- Dreadful! The dinner buffet probably cost them about 10 dollars to prepare very basic stuff but still they wanted around 50 dollars for my wife and to eat and also insisted we pay there and then as the restaurant is “not part of the hotel”. Overall a very strange and disappointing experience. So bring your own food! Internet only works in reception! Supposed to be under new Management I dread to see what it was like before! Such a shame, with a little more effort this could be a proper luxury hotel and place to stay!